"Kirchweihfest" is a German word that means "church dedication feast," a celebration that highlights the importance of reserving a church building for sacred actions and sacred things, for the glory of God and the sanctification of man. 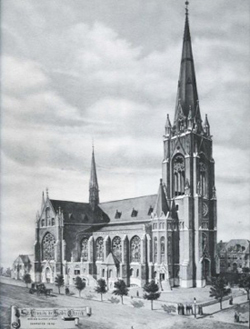 The German roots at St. Francis de Sales are deep, reaching back to the German immigrants of St. Louis, who built this church in 1867, and rebuilt it after a tornado destroyed the first in 1896. 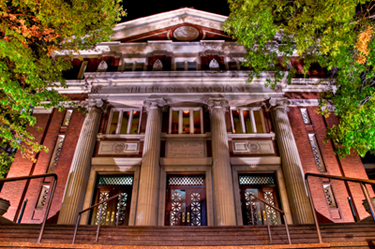 The present church building was dedicated on November 26, 1908. 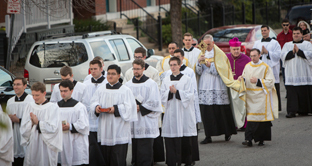 In addition to marking this milestone, this year's Kirchweihfest will be an occasion for us to show our support for the seminarians, the future priests who will serve the Church and oversee many more “Kirchweihfests” in the coming years. Please join us, and the Seminary Society which organized this year’s event, for this double celebration! The festival will include: Christkindl Market, Rector's Raffle, Chocolate Cake Contest, entertainment provided by the Waterloo German Band, and much more! This year we will again have our Novena to the Immaculate Conception with guest homilists nightly.Please mark your calendar and bring a friend. 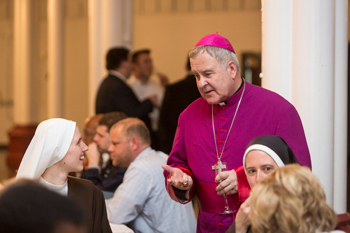 GAUDETE GALA 2014 – TICKETS FOR PURCHASE NOW! Advent will be here soon. As the new liturgical year unfolds before us, what a great blessing it will be to be immersed in the unfathomable spiritual riches of Holy Mother Church! In the midst of Advent is Gaudete Sunday, whose theme, “Rejoice!”, will fill our hearts with joy as we anticipate the coming of our Blessed Savior. 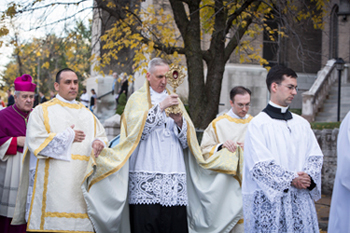 More than a fundraiser, the Oratory’s Gaudete Gala, now in its fourth year, is a unique and festive musical expression of the joy of Advent, and the gratitude for the blessings of the sacred liturgy. 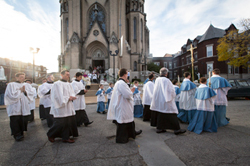 The Gala will give the Oratory faithful and clergy an opportunity to share the Church’s rich Sacred Music tradition – something we experience every Sunday - with one another, with our friends and family, and with our city community at large. Featuring the choirs of the Oratory under the direction of Mr. Botkins, the Gala will also highlight the wonderful talents developed through the Oratory’s Sacred Music Program in the past nine years. All proceeds from the Gala will be used to support the Sacred Music Program. Two examples of the Oratory choirs’ repertoire may be heard here: O Sacrum Convivium, composed by Mr. Kevin Allen, and a Kyrie from Max Filke’s Mass in Honor of the Blessed Virgin. These are the fruits of our labor – a joyful expression of love of music and love of the Sacred. We cordially invite you and your families to come to the Oratory’s Fourth Annual Gaudete Gala, and urge you to invite others to come share the beauty of sacred music with us. Admission to the Gala will include a festive Hors d’Oeuvres Reception before the concert. After the Concert, there will be a brief opportunity to gather again to meet and greet the choir. Acknowledgments: The Oratory would like to express our deeply felt gratitude to several supporters for their generous donations to defray the cost of the Gala. We would also like to thank Mr. & Mrs. David Schlafly, Mr. Chris Poehler, and Ms. Susan Barrett for co-chairing the Gaudete Gala Committee this year. Lauds. The first light of the day has penetrated the stained glass windows of the Oratory, bringing the saints and angels into the sanctuary in an array of colors: reds, blues and greens. By Compline, the ever-present images in windows recede into the shadows amidst the prayers of the Oratory community, waiting again for Lauds and the first light of morning. 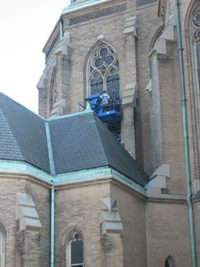 Stained glass windows are known to withstand the test of time, but never without periodic repair and restoration. 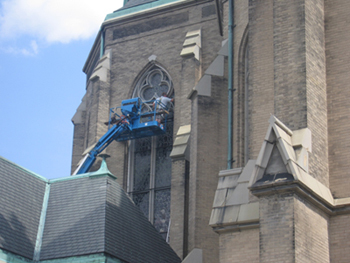 Our windows are close to 100 years old; weathering and the ravage of time have made repairs an unavoidable task for us. Within the last five years, several windows were so badly damaged by storms that decisive actions had to be taken to preserve them. 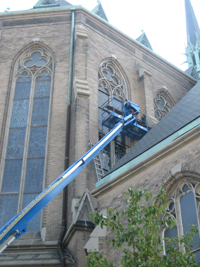 In December 2009, a window in the choir loft had to be removed and stored until suitable repairs can be made. Then last winter, the beautiful window in the sanctuary, featuring Sts. Jerome and Gregory, was so damaged by the storm that it had to be repaired immediately. Working with the Emil Frei and Associates, the original crafters of our windows in the last century, it took several months of work to complete the repairs, but the process has gained us many insights into the methodology we will need to restore all our historic windows in the future. Typical of windows of this age, the level of restoration depended on the condition of the glass and support structure, and, unavoidably, budgetary constraints. The Frei experts found the outer protective glass and the glazing had deteriorated badly from normal wear and tear, and the supporting terra cotta mullions were cracked and failing, thus unable to completely support the glass. 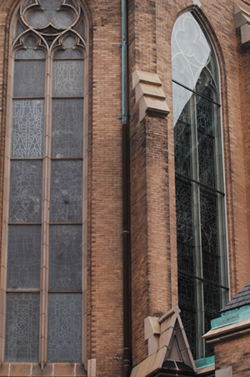 Instead of rebuilding the terra cotta support for this glass, a larger, thicker protective glass was installed farther out from the stained glass and a new support constructed, thereby retaining the architectural quality without overloading the terra cotta mullions. Both the inside stained glass and the outside protective glass were cleaned and re-glazed. 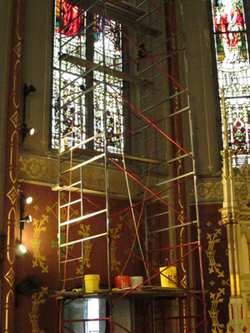 This repair also has a large thermal benefit since a recent study of the heating and cooling needs of the church building has shown that the windows, by far, are the worst contributor to heat loss in winter and would be detrimental to any attempt to air condition in the summer. By moving the protective glass farther away and using thicker glass material, there will be a significant improvement to the obvious thermal inadequacies of the building. 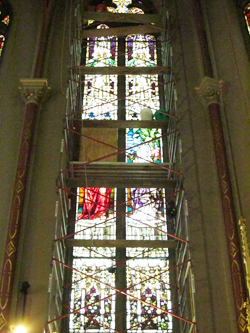 In addition to structural integrity that is leak-proof, the restoration has made a big difference in the appearance of the window from inside the sanctuary: clearer, brighter, and more vibrant. The brighter Jerome-Gregory window can now serve as a model for the repairs that we will need to do on all of our iconic windows. 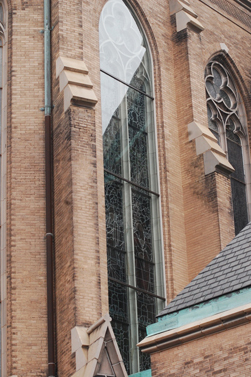 We will work with Frei to determine the next window that is in most need of repair. Update on the last matching gift of $4,300.00: There is still an opportunity to help with this generous initiative. We still need $3,940.25 to match this donation. 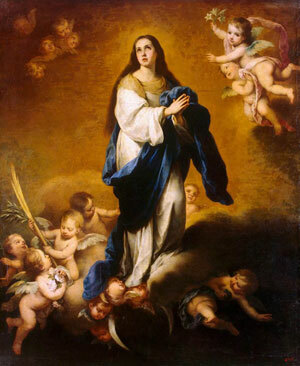 The deadline has been extended to December 8, the feast of the Immaculate Conception. 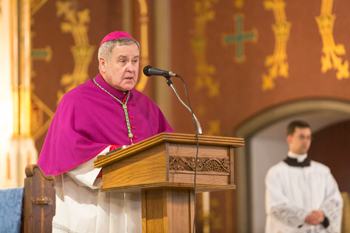 On October 19, 2014, His Grace, Archbishop Robert J. Carlson, came to visit with the Institute’s community and faithful at St. Francis de Sales Oratory to celebrate the 800th anniversary of the birth of King St. Louis and the 250th anniversary of the founding of our city. 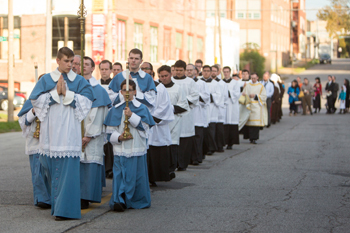 Led by Archbishop Carlson, the clergy of the Oratory and 300-plus faithful honored King St. Louis with a procession of his sacred relic. After the sermon of Archbishop Carlson the celebration then continued with Vespers and Benediction of the Most Blessed Sacrament. 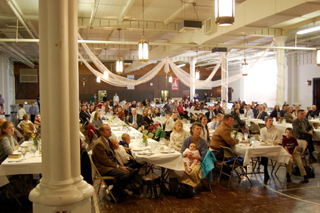 The evening ended with a joyful and festive reception in the church hall, where many faithful gathered to greet the Archbishop, and to celebrate a noteworthy milestone in Catholic history, a milestone that drew together a saintly Old-World French king, missionaries to the New World, and our present day work toward a future filled with hope and charity. 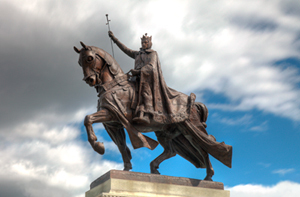 Here's the link to the coverage of the local archdiocesan newspaper St. Louis Review. On the occasion of the anniversary of the consecration of the church building St. Francis de Sales, I wish to thank you all for your many sacrifices and joyful work you have done and continue to do for the benefit of countless families and individuals.